California's Prison Sterilizations Reportedly Echo Eugenics Era : The Two-Way At least 148 female inmates at two state facilities underwent tubal ligation surgery between 2006 and 2010, according to the Center for Investigative Reporting. 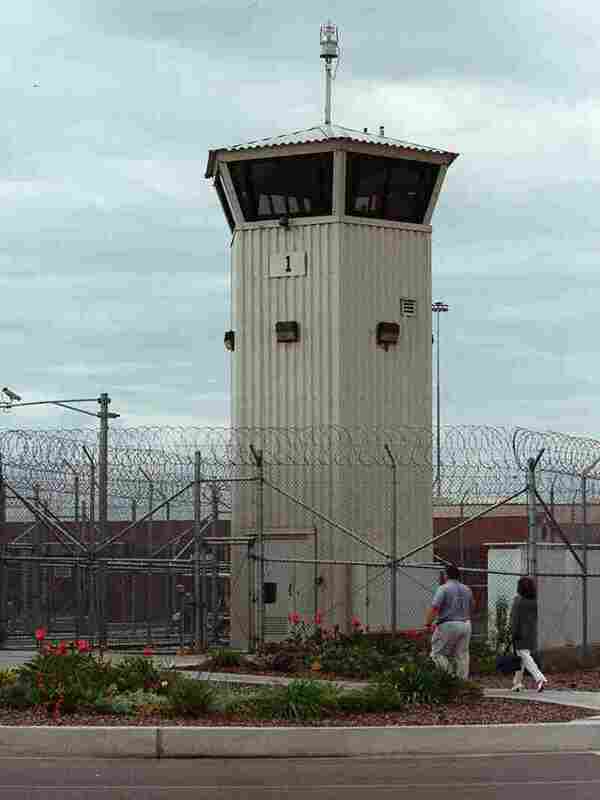 From 2006 to 2010, at least 148 female inmates at two California facilities had tubal ligation surgeries. Some of the surgeries took place at the Valley State Prison for Women, seen here in 2000. Nearly 150 women were sterilized in California's prisons without the state's approval, a practice that critics say targeted inmates who were seen as being at risk of serving a future jail term. Those numbers represent data from 2006 to 2010, according to the Center for Investigative Reporting, which first reported the news. Doctors performed tubal ligation surgeries on at least 148 female inmates at two facilities, reports CIR's Corey G. Johnson, with another 100 cases possibly taking place between 1997 and 2010. In that span, the California Department of Corrections and Rehabilitation paid surgeons a total of nearly $150,000 for conducting the procedure. A former inmate who worked in the infirmary at Valley State Prison in Chowchilla, Calif., tells Johnson she often heard other female inmates being asked to agree to be sterilized, especially if they had already served other prison terms. "I was like, 'Oh my God, that's not right,' " Crystal Nguyen, 28, tells Johnson. "Do they think they're animals, and they don't want them to breed anymore?" Defenders of the program, which may have existed without any state official's formal approval, say that it gave women in prison the same options as women elsewhere in America. And they claim that in some cases, pregnant women committed crimes with the ultimate goal of receiving medical care in prison. Valley State Prison's former OB-GYN, Dr. James Heinrich, says he offered the procedure as a service to women who had previously undergone cesarean sections. And he says the state's paying $147,460 for the procedures was reasonable. "Over a 10-year period, that isn't a huge amount of money," Heinrich says, "compared to what you save in welfare paying for these unwanted children — as they procreated more." Like more than half of all U.S. states, California once sterilized people against their will, in eugenics programs "that sought to prevent social ills by seeing that those who caused them were never born," as NPR reported in 2011. The legacy of decades of forced sterilizations is still playing out — in 2012, North Carolina was poised to become the first state to offer compensation for such programs, before legislators refused to add funding for the measure to the budget. "Federal and state laws ban inmate sterilizations if federal funds are used, reflecting concerns that prisoners might feel pressured to comply," CIR reports. "California used state funds instead, but since 1994, the procedure has required approval from top medical officials in Sacramento on a case-by-case basis." For his story, Johnson spoke to inmates who had undergone the surgery, as well as others who say they were pressured to do so. While at least one woman told him she was happy with her decision to have the surgery, others didn't. Former inmate Kimberly Jeffrey, 43, tells Johnson she resisted the pressure to get a tubal ligation done — pressure that she says came while she was under sedation and strapped to an operating table. "Being treated like I was less than human produced in me a despair," Jeffrey says, adding later that she sees the state prison officials as "the real repeat offenders."